The R-rule of 1907 was up to revision as of December 31st 1917, but Europe was in war (1914-1918) and no meeting in IYRU could be called to agree upon revisions to the rule. The Scandinavian countries were not affected by the war to the same extent as Britain and Germany, and the Norwegian designer Johan Anker urged for the Scandinavian designers to agree upon how to turn the development of the yacht design in a more sound direction. Scandinavian Sailing Federation was founded in April 1915. Members were Denmark, Sweden and Norway. Johan Anker of Norway was elected its first President. The objectives were to continue promoting Scandinavian yachting interests internationally as mutually agreed. The Swedish ship owner Ivar Lignell from Gothenburg suggested the establishment of a sailing federation in Scandinavia to coordinate the interests of the Nordic yachtsmen during wartime, as IYRU in London was not operative. As the Nordic countries managed to stay out of the war zone racing was still active in Scandinavia and Finland. Norway had during the war the largest fleet in Europe of racing R-yachts. Lignell corresponded with the Norwegian designer Johan Anker and it was agreed to have a meeting in Gothenburg to discuss the matter on a broader basis with the sailors. The outcome of this discussion was for KNS to call for an official meeting in Oslo with sailors from the Scandinavian Yacht Clubs. The meeting took place on April 16th 1915 with representatives from the Scandinavian countries National Sailing Federations in Denmark, Norway and Sweden. The foundation of Scandinavian Sailing Federation (SSF) was a fact with Johan Anker as its first elected chairman. 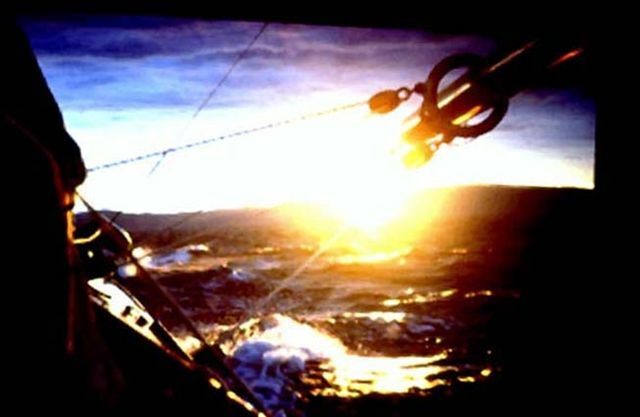 The purpose of SSF as laid down in the articles of agreement were to promote the yachting interests of Scandinavia, act jointly in regard to international yachting matters, and continue international racing with common rules. To start with the intention for SSF was to be in operation as long as IYRU was out of action. However, it proved to be strength for the yachting interests in Scandinavia to have a forum to discuss and coordinate matters of common interest, and SSF remained in operation also after the war. Members of SSF played an active role in reactivating IYRU in 1919. In 1920 Finland joined SSF as an official member. One main activity for SSF was to suggest a revision of the international rating formula, the R-rule of 1907, which expired on Dec. 31st 1917. The initial discussion in 1915/1916 included replacing the international formula with a new formula to be temporary in force until the international formula expired. A new formula with less influence from hull factors beam B, girth G and girth difference “d”, more in line with the Universal rule and the American rule. The first meeting in SSF was held in Stockholm on February 5th-7th 1916. Revision of the R-rule was up for discussion and Johan Anker presented a proposal in line with the last thoughts. A committee was set up with representatives from all three Scandinavian countries, the father of the International R-rule of 1907 Alfred Benzon from Denmark, the father of the Swedish Squaremeterrule of 1908 Karl Ljungberg from Sweden, and Johan Anker from Norway. The committee commenced working and a formula was presented based upon Johan Ankers thoughts during the February meetings. Length L is to be measured above floating waterline L.W.L. as per the Copenhagen Cruiser Rule (S-rule of 1903) with girth measurements at the ends reflecting the more efficient waterline length. Beam B is taken out of the formula in order to promote wider hulls. The main new principle is that the girth difference 3d is replaced with 3X. X is the length of the perpendicular measured from the deepest point on the concave part of the skin frame to a straight line drawn in an angle of 45 degrees to the floating line in point of contact with the skin frame. As such the depth of the wooden part of the hull could be increased without penalty, which together with the reduced factor on G from 1/2 to 1/10 would allow for deeper keels with more stability. S is sail area and F is freeboard. K is the division factor. Finlands designer Gustav Estlander residing in Sweden strongly supported this proposed formula which he expresses to be the coming International Rule. He concludes the formula will result in seaworthy and cruising friendly yachts in between Finlands existing “American” and “International” yachts, and that existing yachts with minor modifications could be modified to fit into the new classes. This S-rule is comparative to the R-rule of 1933 (no beam and limited/no girth in the formula and less taxation on girth difference). However without the restrictions set on minimum beam and maximum depth as in the R-rule of 1933, the outcome would not be as intended getting away from narrow V-shaped hulls. The committee continues their work for presentation at the upcoming meeting in SSF to be held in Copenhagen on October 28th/29th 1916. KNS yachting magazine Seilas reports in fall 1916 that although the intention was to have the new formula approved for construction of yachts to the1917 season, this may not happen as more considerations are needed, and that the new rule to be called the S-rule would likely not be put into force before January 1st 1918 when the R-rule expired. In this modification to the R-1907 formula beam B has a reduced impact given a factor 1/3 instead of 1 and girth G a factor 1/3 instead of ½. Sail area has an increased penalty factor from 1/3 to 2/3. The overall division factor is increased from 2.0 to 2.2. As such the compromise of having a modification to the international rule instead of a new intermediate formula seems to meet the requirement of promoting more cruiser friendly yachts with increased stability, wider hulls, more depth and less sail area. 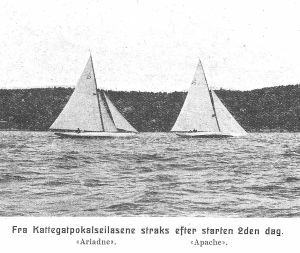 To the races in the 7m Class in Gothenburg 1917, Denmark met with 7mS “Pioneer”, Sweden had 7mS “Sphinx” and Norway 7mS “Pirat” constructed by Anker. The result was not as expected. “Sphinx” was superior to her two 7mS contenders although with her reduced sail area she could not keep up with the 7mR-yachts especially in light wind. And the hulls were still V shaped and narrow. 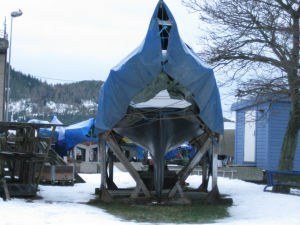 At Anker & Jensen's yard at Vollen outside Oslo they were eager to keep up design work and construction of new yachts. As the R rule of 1907 expired on 31st. December 1917 it was important for the yards to have a common basis for new yacht designs to come. Norway was at the time one of the largest yacht constructing countries in the world, with Anker & Jensen Boatyard outside Oslo in the lead. The matter was discussed on meetings in SSF on Saturday and Sunday, September 15th-16th 1917. The purpose was as before to call upon more cruiser friendly and seaworthy designs within reasonable cost. Discussions were constructive. The meeting agreed to take beam B out of the formula inviting the designers to construct more wide yachts. The measurement of G was slightly changed compared to the R-rule of 1907. G to be measured in the position were G is largest. If this position is aft mid ship (55%), the sum of girth from covering board to covering board and beam should in no position further aft be more than at the measurement position. This is subject to a straight keel with now hollows. The major change was the measurement of “d” in line with “X” in Ankers proposal of Feb. 1916. A chain of length 3/8G is stretched from waterline level in G position down to a point on the underwater hull on both sides. The difference between the added skin girths from these two points to the waterline level, and 2 times 3/8G, is “d”. Penalty on sail area was increased from 1/3 to 2/3 and overall division factor increased from 2.0 to 2.1 compared with the R-1907 rule, keeping the same yacht classes as before. Length L is measured on a level 1% of the rating class above L.W.L. plus girth differences in both ends reflecting the more efficient waterline length. The outcome was the S-rule of 1917 made in force from Jan 1st 1918, same time as the R-1907 rule elapsed, and made valid for 5 years to follow. The principles of measuring "L" higher than L.W.L. and limit the measurement of girth difference "d" to a determined point on the skin were later adopted by IYRU in the revised new R-rule of 1919 to come. Restrictions were put on outfitting and inventory for the different classes. Classes agreed upon were S19, S15, S12, S10, S8, S7 and S6. The 9 meter and 5 meter classes are left out. Cabin top is not a requirement on the 8mS Class and above. The 7mS Class is divided in closed yachts with a limited cabin top of 15cm height and open yachts. The 6mS Class is open yachts. Minimum displacement for the 6m Class is 1.2 tons and for the 7m Class 1.8 tons. Restrictions on spares were laid down. Hollow masts were not permitted for yachts above 7m. Minimum diameter of masts was laid down. For an Eight, minimum diameter in a position 2/3 of the mast height was 160 mm. No restrictions on weight and length of masts. The thoughts were that this would regulate itself as part of the design. The S-rule of 1917 was a success. In total 20 Eight Metres were during 1918 and 1919 constructed in Scandinavia based on this formula. The objectives were met. More cruiser friendly yachts with the same hull size as the R (1907) Eights. Increased beam, and the V-shape typical for the latest R (1907) yachts was no more. Sail area was decreased and the yachts were fitted out with Marconi rig and Bermuda sails lot easier to handle for the crew. For racing between R (1907) yachts and S (1917) yachts SSF had decided upon a handicap of 12 sec. per nautical mile in wind forces less than 5 m/sec due to the R (1907) yachts larger sail area. This was nullified by SSF in their meeting in Copenhagen on September 26th 1919. The Kattegat Cup was moved to the new 8mS Class and races commenced in 1918 and 1919. 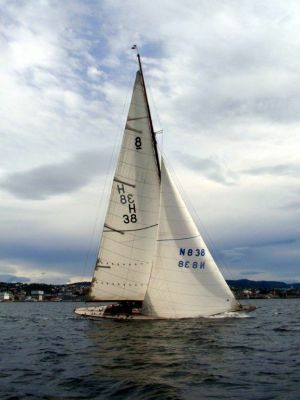 Winner both years was sH25 “Apache” designed by Johan Anker. In their meeting in Gothenburg on January 18th 1920, SSF decided to move the Kattegat Cup to the new International 8mR Class. No races for the Kattegat Cup was called for in 1920. In the Antwerpen 1920 Olympics sH27 “La France” commissioned to the R-rule of 1919 with sail no 8N6 and named “Lyn” won silver medal in the 8mR “new class”. Winner was 8N2 "Sildra" tailor designed by Johan Anker to the R-1919 "New Class". The S-1917 rule expired 1922. Several of the still racing R-1907 rule yachts were fitted out with Bermuda sail and reduced sail area. The handicap was removed and the yachts commenced racing in a combined class – “The Old Class”. Go to Contents: “Snarken” history - part I and part II. The scantlings for the S-1917 rule remained the same as for the R-1907 rule except for the dimension of the bow beam which were increased to 110mm for an Eight Metre, ref last paragraf under S-1917 articles (byggningsregler). Yachts laid down prior to Jan 1st 1918 to comply with scantlings for the R-rule of 1907.